CooksRecipes has quality, kitchen-tested recipes for boiled, braised, fried, sautéed and skillet-cooked pork chop dishes that you can count on for successful deliciousness. Want to dress up your pork chop? 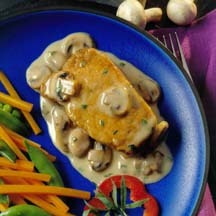 This easy mushroom sauce turns a simple pork chop into a great meal. 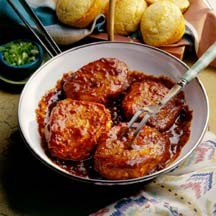 This is a quick way to serve up tangy barbecue flavor in a hurry from your stovetop. 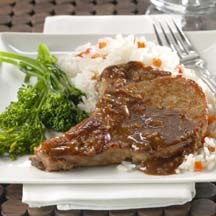 Fast braising makes these pork chops tender, and the braising liquid adds flavor power. Pork Chop and Waffle Sandwiches with Maple "Gravy"